Sitting at 22-13, the men’s baseball season is winding down meaning the team will soon shrink due to graduation. This year the Duhawk baseball team is graduating 11 players (Aidan Wojciehowski, Nick Spiess, Ryan Koester, Tyler Tomaka, Brad Schwind, Nolan Even, Thomas Greffly, Robert Hovey, Michael Muto, Danny Weis and Ben Milks), and one student manager (Will Quinn). The seniors have won 70 games thus far during their time wearing purple and gold. 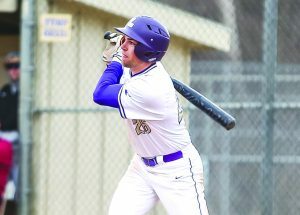 Photo courtesy of Loras College Athletics — Senior outfielder Danny Weis rips a powerful swing here at Petrkis Park down by the Mississippi River. Unfortunately the ball was caught by the cross town rival, University of Dubuque Spartans. In the 2018 season the seniors led the team to extra innings against the University of Iowa, swept Wartburg for the first time since 1995 (the year many of them were born), helped coach Tebon to his 500th career victory as a collegiate coach, and tied an individual single season record for saves (Tomaka). The team has also featured two pitchers who pitched in the prestigious Northwood’s league this past summer (Wojciehowski and Schwind), and two players in the 100 hit club (Koester and Weis). The accomplishments of this class have been well documented, making goodbyes difficult to a class that’s meant so much to the program. Fortunately for the seniors, the season is not quite over yet. This past weekend, the team took the field against archrival UD. “It’s an honor to be able to start game one on senior weekend against rival UD. The job also comes with responsibility, which I gladly accept. This year the IIAC is closely packed, and setting the tone for such an important weekend this late in the season is important,” said Schwind in anticipation of the game and his final start at Petrakis. The UD Spartans struck early, however, and held the Duhawks in check. The final score was 10-1 UD. Highlights, thought, include junior Austin Konagel extending his streak of reaching base to 32 straight games (every game this season). Game two featured Speiss on the mound. Entering the game, Speiss was 3-1 with a 3.57 era. Saturday afternoon, Speiss and the rest of the pitching staff did their job: they were able to cool off the Spartan offense, allowing only two runs. Unfortunately, the Duhawks offense couldn’t capitalize; they were unable to come up with a timely hit. In total, the Duhawks left 11 runners on base in the second game, and only managed one run in the first inning, off a single by junior Jake Oglesby. So the Duhawks lost game two of the series by a score of 2-1. In the game senior pitchers Milks and Wojciehowski threw five scoreless innings combined, striking out four Spartans and giving up only two hits. Hoping to avoid a sweep, Hovey started game three. This was a heart-breaking battle, as UD struck early, scoring five runs in the first three innings. In the bottom of the fourth, the Duhawks rallied, as Oglesby singled, allowing junior Cole Thompson to score. Then junior Richard Bryza tripled, scoring Koester and Oglesby. In the top of the inning, UD got two runs back off Nolan Even, making the score 7-3 in their favor. Fortunately the Duhawks team didn’t quit. They were able to take the lead, scoring five runs in two innings – making the score 8-7 – while Tomaka held the Spartan offense scoreless over 3.2 innings. Unfortunately it wasn’t to be, as the UD offense struck in the top of the ninth for four runs, making the final score UD 11, Loras 8. Despite these losses, the men still sit fifth in the conference with four games ahead. On Tuesday the Duhawks will head to Storm Lake, IA, to take on Buena Vista at 6 p.m. Their season will conclude with a three game series against Central College in Pella, IA. Regardless of the outcome this weekend, the season is sure to hold some surprises and will have an exciting finish.